Home » Website Building » SEO » How to Add and Verify Site in Yandex Webmaster Tools? How to Add and Verify Site in Yandex Webmaster Tools? Yandex is the popular search engine having more than 65% of search engine market share in Russia. Even though Yandex offers searches primarily in Russian language it also offers Webmaster Tools account in English with limited features. This helps webmasters and site owners from international community to submit their sites to Yandex search engine. This article explains how to add your site in Yandex Webmaster Tools and verifying ownership with the verification methods offered. Yandex previously was offering anonymous site submission without the need of registering for webmaster tools account. This option is currently terminated and Yandex Webmaster Tools is the only way to submit your site to Yandex. It is highly recommended to have registered account in order to make use of all the features available in Yandex Webmaster Tools. 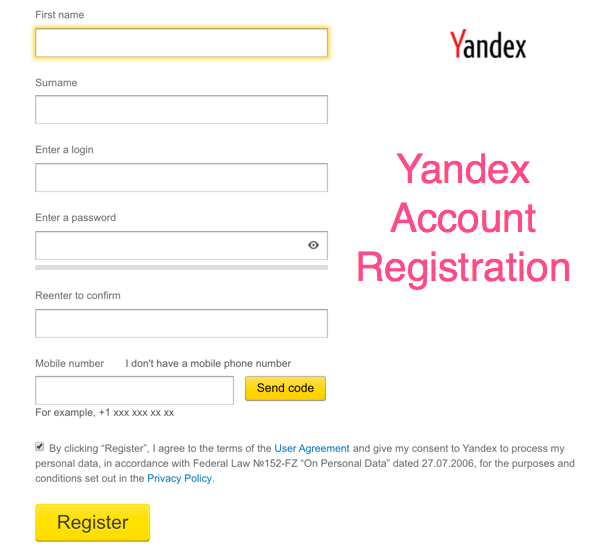 Click here to register for a free Yandex Webmaster Tools account in English. Remember this is like a single sign on which means the account credentials can be used for logging into all Yandex sites. Once you registered and activated your account, click here to login to your account. 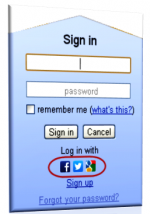 Yandex also allows you to login to webmaster tools account using Facebook, Twitter or Google account. Once you logged in to your account, click on the “+” button available next to the “Select site” dropdown box. Enter your site URL in the box and click on “Add site” button. Remember to enter a correct URL with or without WWW since they are two different sites from Yandex perspective. The next step is to verify the ownership of your site and Yandex offers three methods to verify your site ownership. This is a simple and recommended method which does not require access to your site’s root directory. Copy the HTML code and paste it on your site’s header section. You need to paste this code on all the pages of your site in order to monitor all the pages. Click on the “HTML file” tab and download the HTML verification file. You can also manually create the file with the specified name with the code provided in the box. Upload the file in your site’s root directory and check the file can be accessible on browser like normal webpage. Return back to Webmaster Tools account and click on “Check” button to verify your site. The last option is to add a TXT entry as a CNAME record in your DNS zone file. 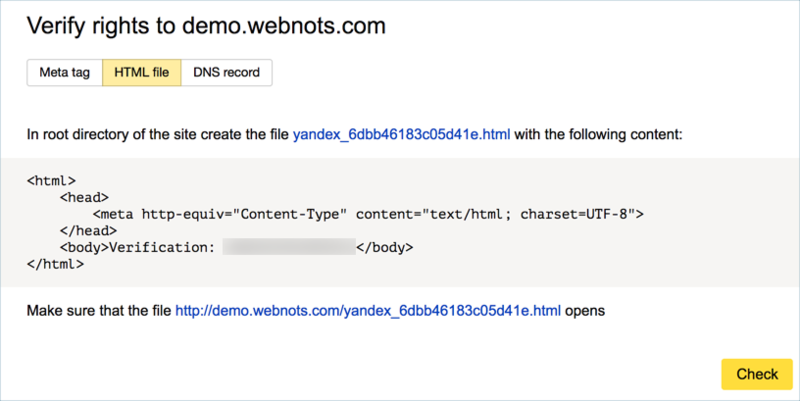 Note the text file upload and WHOIS email id verification methods offered previously by Yandex were no longer available. Once you have completed any of the verification method don’t forget to publish your site and then click on the “Check” button to see whether Yandex search engine can reach your site. It may take few minutes for Yandex to check the relevant verification file or code is inserted on your site. Changes made on DNS settings may take up to 48 hours for propagation, hence if the verification fails you may need to wait for a day before trying again. Also ensure to clear all caching of your site at server level / plugin level / CDN level before verification. When the verification fails, Yandex will show the message indicating the problem as shown below. In this case we have updated meta tag and wrongly clicked on the check button under HTML file section. 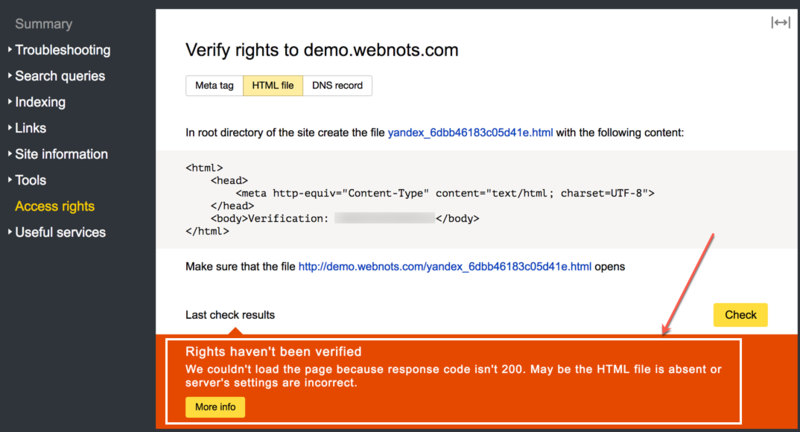 Hence the verification is failed with the error message showing that the response code is not 200. Once the site is verified successfully, you will see the dashboard under “Summary” section like below. Also the verified site will be added in the dropdown box of the top navigation bar for selection. You can delete the site from Yandex or only revoke the verification access of your site any time later. In order to remove your site, click on the “All sites” button from the site selection dropdown box. Click on the “X” button and then press “Delete” to remove your site from Yandex webmaster tools. If you only want to revoke the verification then navigate to “Access rights” section of the site. Click on the “Reset rights” button and then “Reset” button. Remember to remove the meta tag / HTML file / DNS entries then before reset the rights. Otherwise Yandex will automatically verify the site again. Once the access is revoked you need to verify your site again in order to access all the features in the account. Be aware that deleting or adding your site in Webmaster Tools account will not affect your site’s ranking in search results. Verifying a site will inform search engines that the site is created by a human and there exist a site owner to monitor the performance of the site in the search engine. In addition site owners can use free features like Sitemap submission, indexing status and geographic settings. Just added my site to YanDex. Thank You. Great articles that provide important informations. This post helped me a lot in understanding Russian interface and finally added my site to Yandex webmaster and submitted sitemap in it. Just added my site to YanDex and Baidu. Thank You. Great website that provide useful information.